greater. Stream macroinvertebrate assemblages generally show a reduction in diversity in response to increasing urbanization, but variable changes in abundances, as moderate levels of nutrient and organic enrichment can increase numbers of invertebrates whereas toxins, temperature change, and siltation generally cause declines. 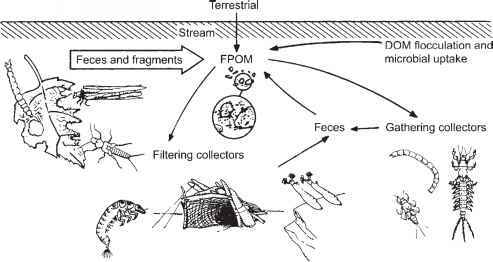 Although macroinvertebrates can be abundant in locations of organic pollution, the assemblage typically is dominated by midges (Chironomidae) and worms (Oligochaeta) (Wright et al. 1995). Improved drainage design to counteract the direct effects of storm drains that connect impervious surface to stream channels is likely to be among the most effective management actions for streams draining urban catchments (Walsh et al. 2005). Individual large mines are point sources, but in areas of the southern Rocky Mountains, thousands of dispersed, abandoned mines from the 19th century silver and gold rush are so scattered they act more like NPS inputs. Because heavy metal concentrations were the best predictor of macroinvertebrate communities at 78 Rocky Mountain sites (Clements et al. 2000), it is likely that the legacy of historic mining activity influences the distribution and abundance of aquatic invertebrates throughout the region. Acid rain and mercury deposition result in widespread and diffuse pollution to surface waters, even at considerable distance from sources. Acidification of freshwaters is a serious threat in regions of poor buffering capacity that have high levels of oxides of sulfur and N in the atmosphere, resulting in acid rain and snow (Section 4.4.3). Acidification of rivers and lakes in Scandinavia, Northern Europe, and the northeastern and some areas of the western United States has been most evident since the 1960s due to the accelerated inputs of pollutants to the atmosphere from the burning of fossil fuels. Sulfur deposition has declined in response to regulatory changes over the past several decades (Driscoll et al. 2001), but N deposition has not (Stoddard et al. 1999). Acidification of streams first affects acid-sensitive species, but when pH falls below 5 most species are affected (Section 4.4.3). Liming of streams to counteract acidification has met with only limited success; acid-sensitive species are observed from time to time but fail to persist (Bradley and Ormerod 2002). Reductions in SO2 emissions in response to clean air legislation in the United States clearly has had beneficial effects, resulting in steadily increasing pH of rain and streamwater in the Hubbard Brook Experimental Forest in New England (Figure 13.13). 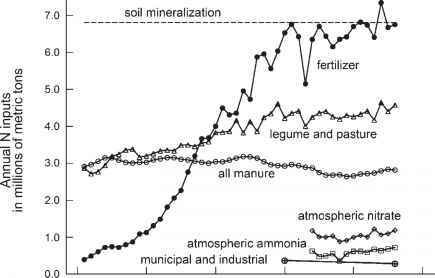 from coal combustion, waste incineration, and other industrial processes (Morel et al. 1998). Methylmercury (MeHg), a form of organic mercury, is produced from inorganic mercury by biological and chemical processes, primarily due to the activities of sulfate-reducing bacteria in anoxic waters and sediments. Because MeHg is bioconcentrated in aquatic food chains, its concentration in fish often reaches or exceeds levels considered safe for human consumption, even in remote areas. The causes of bioaccumulation of MeHg are complex, but involve its solubility in algal cells and lipids and ready absorption through the intestinal wall of fishes, rather than direct uptake of mercury from the water. Because inorganic mercury does not readily enter food chains, its conversion to MeHg is critical to mercury accumulation. The construction of reservoirs results in increased methylation of inorganic mercury by microbes. The amount of MeHg produced increases in relation to the quantity of organic carbon (C) stored in flooded vegetation and soils, showing an initial pulse and elevated levels in the water for years (Hall et al. 2005). Thus atmospheric deposition and dam construction can act synergistically to increase the human health risks of fish consumption. Overexploitation is of primary concern for fishes and some other vertebrates including amphibians, turtles, crocodilians, and certain water-associated birds and mammals; and for mollusks and some decapod crustaceans. Its importance relative to other causes of imperilment can be difficult to assess, partly due to lax record keeping, and partly because exploited stocks commonly face multiple threats including dams, habitat degradation, and pollution. Few freshwater invertebrates are imperiled due to direct harvest (Strayer 2006). However, mussels, valued for their shells, pearls, and meat since prehistoric times, have been extensively harvested in Europe and North America. Some reports describe quantities that would be unimaginable today, such as the >13 million kilograms of shells taken from the waters of Illinois in 1913 (Claassen 1994). These harvests were directed at abundant species, but the consequences of the bycatch for rare species may also have been significant (Strayer 2006). Today, freshwater mussels are harvested for their shells, which are cut into small spheres and used as seed pearls in saltwater oysters for the development of cultured pearls in Japan, China, and Australia. Regulated commercial harvests presumably are sustainable, but illegal harvests of mussels have been reported in the Midwestern United States, and so poaching poses an additional risk. Overexploitation of freshwater turtles is the single most important threat to the turtles of Asia, where the majority of individuals are sold as food but most species are also sold for traditional medicine and as pets (Cheung and Dudgeon 2006). Almost one million individuals comprising 157 species, including 72 globally threatened species, were encountered in a market survey of three cities in south China, the world's largest consumer of turtles. Because some trade is covert, these may be underestimates. Little is known of the ecology of most Asian turtles, making it difficult to assess the ecological consequences of this harvest. All turtle species in and around Tonle Sap Lake, Cambodia, are seriously threatened by trade, as are seven species of water snake (Colubridae: Homa-lapsinae). Market surveys indicate that in excess of 8,500 water snakes are sold daily, primarily for crocodile and human food, in what may be the most intensively harvested snake assemblage in the world (Campbell et al. 2006). Commercial and recreational fisheries have each been responsible for serious declines of highly valued freshwater fishes. Many of the large, long-lived species of river fishes around the world are endangered, with overfishing a contributory cause, including several carp, catfish, sturgeon, paddlefish, and a whipray of Asian rivers (Dudgeon et al. 2006). As the commercial fishery of the Peruvian Amazon has become more technologically advanced, high harvest pressure appears to be driving that fishery toward smaller fish and greater effort to achieve full capacity catches, classic signs of overfishing (De Jesus and Kohler 2004). Recreational overfishing deserves more attention, as substantial numbers of people are involved in some countries, fishing effort may be less likely to decline when stocks approach collapse levels, and even in catch-and-release angling, there can be postrelease mortality and sublethal effects on growth and fitness (Muoneke and Childress 1994, Cooke et al. 2002). Four important recreational fisheries in Canada experienced significant but largely unrecognized declines over the last decades of the 20th century (Post et al. 2002). The reason why this ''invisible collapse'' has not attracted more attention are speculative, but Post and colleagues suggest that anglers have come to expect less (the ''shifting baseline'') and have adapted by switching to different and less valued prey. In addition, recreational fishing and aquaculture are the most important reasons for the spread of nonindigenous species, and thus have a very important but indirect influence on freshwater biota (Cambray 2003, Cowx and Gerdeau 2004). 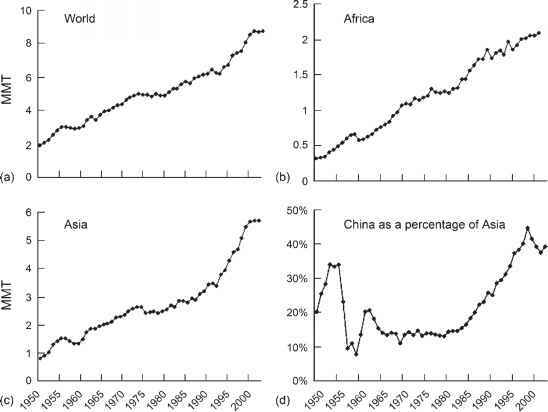 Overfishing has often been the first in a historical sequence of threats to fish populations, followed over time by pollution, habitat degradation, introduced species, and climate change (Jackson et al. 2001). This is well illustrated by the history of the Murray cod Maccullochella peelii of the Murray-Darling River, Australia's largest (up to 114 kg) freshwater fish (Rowland 1989). Based on records from railroad consignments and the markets in Melbourne, a large fishery had developed by the 1860s, with sales in urban markets peaking in the early 1900s, followed by a decline. Fishing became unprofitable by the 1930s, and then the Depression and World War II may have helped to end this period of overfishing. A second expansion of the fishery occurred from 1940 through 1955, followed by a second decrease to much lower levels by the early 1960s. By this time, however, the cumulative impact of dams, increased pollution, a growing recreation fishery, and the impacts of Eurasian perch on young cod combined to prevent the now reduced cod populations from recovering. Bringing this historical sequence to the present, hatchery stockings are contributing to the recovery of the Murray cod, and although the giants of the past are unlikely to be seen again, a recreational fishery has benefited. followed by smaller individuals, undoubtedly occurs in freshwater fisheries. However, inland waters often are dominated by small-scale commercial and subsistence fisheries that provide seasonal employment and protein for local consumption, and preferences for small fish in many African cuisines and the use of fish pastes and sauces in Asia encourage harvest of small species. As a consequence, freshwater fisheries may experience a mix of fishing down and fishing for all size classes. Changes in fishing gear are one indicator of overfishing, as nets of finer mesh are more time consuming and expensive to make than coarser mesh sizes, and will be adopted by fishers only out of necessity. In the foothill rivers of the Venezuelan Andes, local fishers use cast-nets to catch migrating Prochilodus, a member of the most widely harvested freshwater fish family in South America. Net mesh is measured by the width of several fingers of the hand, and over the last 20 years net mesh has declined from "four fingers'' to "two fingers'' to accommodate the decreasing size of the target (Taylor et al. 2006). Overfishing of inland waters threatens the well-being of tens of millions of fishers who rely on this resource for income and food. It also threatens ecosystem health due to the loss of apex predators and influential species. Declines in Pacific salmon, attributable partly to overexploitation, have demonstrated the importance of marine-derived nutrients that these migrants transport into unproductive freshwater environments and the wide variety of consumers including birds and mammals that relied on this predictable food supply (Willson and Halupka 1995). The flannel-mouth characin Prochilodus, declining in Venezuelan rivers in part due to overfishing, has profound effects on ecosystem processes as described in Section 10.5. There is a broad consensus that rising levels of carbon dioxide (CO2) and other greenhouse gases in the atmosphere have contributed to an approximately 0.6°C temperature increase over the past century (IPCC 2001). Further changes in greenhouse gases and other atmospheric pollutants are expected to result in significant additional warming by 2100, particularly at latitudes between 40°C and 70°C, as well as substantial regional and seasonal variation in precipitation. Climate change undoubtedly will have important consequences for aquatic ecosystems, having proximate effects due to changes in temperatures and flow regimes and more subtle effects due to changes in riparian vegetation, disturbance intensity and frequency, water chemistry, and species interactions (Meyer et al. 1999, Allan et al. 2005b). Some future impacts have a high likelihood of occurring but much uncertainty remains, partly because future climate conditions at regional and local scales are uncertain (Stainforth et al. 2005), and partly because of the complexity that results from climate change acting through multiple pathways. In addition, climate change will interact with other threats to lotic ecosystems, enhancing some regional water shortages, favoring species invasions, and acting as an additional stressor on the biota. Most freshwater organisms are adapted to a particular temperature range (Section 5.31), and so poleward distributional shifts under warmer climate scenarios are highly probable. Studies predict a northward latitudinal shift of approximately 500-600 km for both macroin-vertebrates (Sweeney et al. 1992) and fishes (Shuter and Post 1990) in response to a warming of 3-4°C. However, dispersal ability varies among taxa and few rivers are barrier-free, and so some species may face limited opportunities. For example, fish in the southern Great Plains and the desert southwest of the United States cannot move northward because those streams and rivers tend to run west and east. Because summer water temperatures now approach the upper limit for a number of species, just a few degrees of warming poses serious risk of extinction for native fishes in these regions (Matthews and Zimmerman, 1990). In mountainous areas, organisms can shift to cooler temperatures by moving to higher elevations, but the species' range will contract, as Keleher and Rahel (1996) illustrate for trout in the Rocky Mountains under a 3°C future warming scenario. Because streams are coolest in the headwaters, small streams are effectively like the tops of mountains, in that once these cool-water refuges are warmed there is no escape route for individuals or populations that are trapped there. Temperature also sets the northern range limit for harmful invasive species such as the zebra mussel (Strayer 1991), and so their expansion northward seems highly probable. The amount and timing of runoff are expected to change significantly under future climate scenarios due to changes in evapotranspiration and precipitation. However, it is difficult to predict at regional scales whether changes in precipitation or evapotranspiration will be greater, and thus whether surface water levels and runoff will increase or decline. When two contrasting General Circulation Models were used to predict changes in runoff for 18 water resource regions of the United States, predictions were the same direction in only nine of the regions, and where the direction was similar, often the magnitude was not (Frederick and Gleick 1999). However, some outcomes are expected with reasonably high certainty. Glacier-fed streams are expected to experience an increase in discharge for years to decades, followed by declines as glacier ice is depleted. In regions that formerly accumulated a winter snowpack, warming temperatures will result in earlier runoff, or a shift to a variable winter flow regime driven by rain events (Barnett et al. 2005). Because winter snowpack is a natural storage reservoir, much of this winter runoff will be lost to the oceans. Due to the important influence of hydrologic disturbance on stream communities (section 10.3 3), a greater frequency and intensity of flooding is likely to be a widespread and important consequence of climate change for lotic ecosystems. The most probable ecosystem response to climate change is an increase in biological productivity. Ectotherms typically increase their metabolism by a factor of 2-4 with each 10°C increase in water temperature, until very near their upper temperature tolerances (Regier et al. 1990). Thus, while changes in species composition may be complex and unpredictable, an overall increase in system productivity is likely to be a common response to climate warming. Riparian vegetation will almost certainly change under future climates, affecting the nature, timing, and supply of allochthonous inputs, and this is likely to affect the processing of detritus and functioning of the microbial-shredder food web linkage in complex ways. 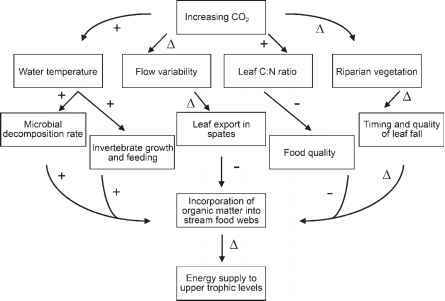 Altered C/N ratios of the leaves likely will reduce palatability, temperature changes will affect leaf processing rates, and floods may export leaf matter before it can be processed (Rier and Tuchman 2002, Tuchman et al. 2002). Figure 1315 illustrates that these interactions are complex and potentially offsetting, making the overall impact of climate on this important energy supply difficult to predict. stoneflies (Leuctra ferruginea) dispersed along the stream corridor with the preponderance of individuals moving in the upstream direction, but some dispersed >500 m across a forested landscape to an adjacent stream (MacNeale et al. 2005). Cross-catchment dispersal indicates the potential for range expansion as new environments become available. However, owing to geographic differences among locations in dispersal opportunities, and differences among species in rates of dispersal, it is highly unlikely that entire assemblages will shift together. There will be exciting research opportunities as ecologists work to understand the novel communities of stream ecosystems in transition. Finally, it is important to note that climate change has the potential to worsen the impact of other threats. 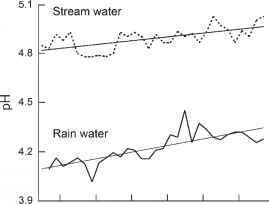 Increases in stream temperature due to riparian clearing will be exacerbated by a warming climate, and become particularly acute if hydrologic changes lead to low summer flows. Flooding may become more severe in many areas due to climate change, but will be more extreme if forest harvest, wetland loss, and impervious surfaces also play a role. As Figure 13.15 illustrates, some pathways are sufficiently complex that even predicting the direction of overall change is extremely difficult.